Superior Water Quality | Lubrizol Advanced Materials, Inc. Families rely on their plumbing systems to deliver clean, safe drinking water. Unfortunately, we’ve seen cases like Flint, Michigan where decision makers have overlooked the impact that piping materials can have on water quality. Other research from Virginia Tech found that CPVC materials, like FlowGuard Gold® pipes and fittings, have the lowest impact on drinking water taste and odor. Many brands of PEX are known to leach gasoline components MTBE, ETBE, TBA and Toluene, all of which can affect drinking water taste and odor. FlowGuard Gold CPVC will not allow outside contaminants to enter your drinking water through the pipe without causing the pipe to fail. Some of the following issues can impact a residential piping system. All plumbing products must meet various federal and state drinking water quality standards and FlowGuard Gold CPVC is tested and approved per NSF/ANSI standard 61 to protect against water contamination. Not all plumbing materials can guarantee compliance with these Federal and State water standards under all conditions. For example, in soft water (pH below 6.5), copper piping may leach metallic contaminants above the recommended limit for safe drinking water, and research shows that copper can damage a protein that defends against Alzheimer's disease. FlowGuard Gold Plumbing Systems are routinely tested to the highest standards for water quality. It fully complies with NSF 61 and NSF 14 and will not cause the water to fail other state-level drinking water regulations under typical water conditions. FlowGuard Gold CPVC is compatible with chlorine-based water disinfection and will not fail under aggressive conditions. Copper does not comply with NSF 61 ratings in all water conditions and temperatures, including at pH values of less than 6.5. At least eight PEX brands do not have NSF 61 rating in all water conditions and temperatures, including elevated temperatures. Some common plumbing systems, such as PEX, are subject to chemical permeation, meaning that contaminants coming in contact with the outside of the pipe may be transmitted through the pipe wall leading to water contamination. FlowGuard Gold CPVC will not allow water contamination through permeation of outside chemicals without causing a pipe failure. The ink from the print line on this PEX pipe has permeated almost completely through the pipe after less than 10 years. In fact, leading PEX manufacturers recommend against exposing their material to environments containing solvents, fuels, organic compounds, pesticides or other detrimental materials that may cause permeation. Unfortunately, there are no standard tests or published lists of materials that might be detrimental to PEX, leaving builders, plumbers and homeowners to guess. FlowGuard Gold CPVC will not allow outside contaminants to enter your drinking water through the pipe. Any chemicals capable of penetrating FlowGuard Gold pipes and fittings at a molecular level would cause the pipe to fail before allowing water contamination. Not only do FlowGuard Gold pipes and fittings have superior permeation resistance, but they are also backed by the FBC System Compatible program to assist manufacturers of ancillary products in determining their product's chemical compatibility with FlowGuard Gold CPVC. In order to ensure the highest water quality, builders, plumbers and homeowners should request technical documentation from product manufacturers demonstrating that permeation will not occur when PEX pipe comes into contact with any materials including, but not limited to, pesticides, fire stops, ink, tape, labels, seismic braces, thread sealants, caulks, foams, insulation, pipe hangers, fire-treated wood, and flexible wire and cable. Biofilms form when biomass such as fungi, algae and mold adhere to surfaces in wet environments. This buildup can contain dangerous bacteria including legionella and e.Coli. 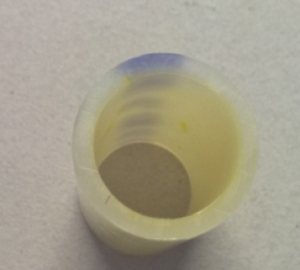 Independent scientists have repeatedly shown that CPVC, such as FlowGuard Gold CPVC, is less likely to support the formation of biofilms than other common piping materials. As water efficient fixtures become more popular, stagnation within the infrastructure increases. Some research indicates that water can spend between one and three days sitting in domestic pipes before being used. In commercial structures, that number can be as high as six months depending on the water efficiency of the building. No piping system will actively fight bacterial growth, but factors such as the microscopic surface profile can affect the growth properties. CPVC has a smooth, hard microscopic surface that reduces the risk of bacterial growth. 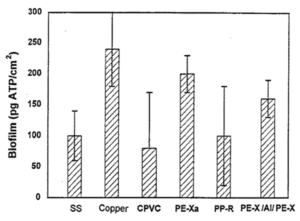 In fact, numerous studies have found that CPVC is among the best performing piping materials for biofilm formation potential, consistently rating better than PEX and copper over the life of the system.